The catalogs of wallpapers for children bedrooms usually find inspiring combinations such as variation in colors as well as patterns. You can get a harmonious combination using similar colors and motifs. The borders will help you stay vertically split and separated wallpapers visually. The room looks amazing if you give a touch of border at the top, in mid or little above of base. Perhaps you have never dared to mix a striped wallpaper and printed wallpaper in the same room. We recommend you to dare this risky combination. If you consider the color palette of the decor and color usage in perspective, the results can be surprising and completely up to date, brings a stylish character and your children will also enjoy new look of bedroom. You can paste striped wallpaper on wall with cabinet and printed on other walls. This resource is used to bring contrast and accuracy in an environment entirely. 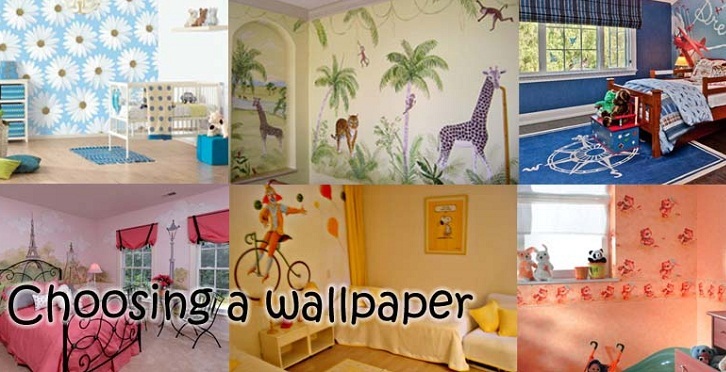 If you opt for such modish combinations, wallpapers for children bedrooms would look attractive. You should always use plain paper on top of the room or on the wall that shouldn’t be main wall; plain paper should be visually lighter in color while can use brighter color of printed wallpaper. The printed wallpaper should be on main wall or the bed wall is best choice. In children’s rooms for girls pink paint is a best choice to combine with fun decorative wallpaper as it gives strong character to room. The paint should be on wall where you can hang photos or some other accessories, or can decorate furniture. Blue paint will go best for boys’ bedroom. You can dare this combination even your children bedroom is small. By following these fresh 2015 wallpapers for children bedrooms combination, you can give delightful look to your children bedroom according to any season.